Road To Nubra : It’s one of the remotest places you can visit in India, a place of indescribable beauty, where bald mountain slopes wrapped in blues, browns, beige, black and violet hues slip and slide to meet a turquoise expanse of glassy water at their feet. Nothing grows in the higher reaches of this desperately beautiful, rocky and arid desert. This contrasts starkly with the lower altitudes, which are surprisingly fertile and dotted with orchards and fields of wheat and barley. The eerie stillness is palpable and the only sign of movement is a wisp of white candy floss wafting past a jagged peak, hinting that this is no still-life on an artist’s easel. Shift your gaze slightly and you will notice an azure ribbon cutting a cleavage through the Karakoram Range, twisting and curling before it disappears to caress the next mountain bend. This is what most vistas look like in the Nubra Valley in Northern Ladakh, an increasingly popular destination for travellers from around the world. For most, it is a once-in-a-lifetime experience and they leave literally speechless, saying it is almost irreverent to describe its austere beauty. Nubra Valley lies between the Karakoram Range and the Ladakh Range, at the confluence of the Nubra and Shyok Rivers. Both rivers have their source in the northern glacial reaches of the Karakoram Range, in the Siachen Glacier, the world’s second-longest glacier outside the polar regions. After these rivers meet in the Nubra Valley, they flow as the Shyok, which eventually meets the mighty Indus that wends its way into neighbouring Pakistan. Nubra is situated on the Tibetan Plateau, and although it is a valley, the average altitude here is 10,000 ft (3,048 mt) above sea level. Geography is only one reason Nubra is as remote as it is. Located on the once ‘busy’ Silk Route, its sinuous mountain roads offered passage to caravans carrying all manner of cargo to and from and Central Asia. However, in the late 1950s, when China sealed its borders with India, trade withered and the already sparse population dwindled. 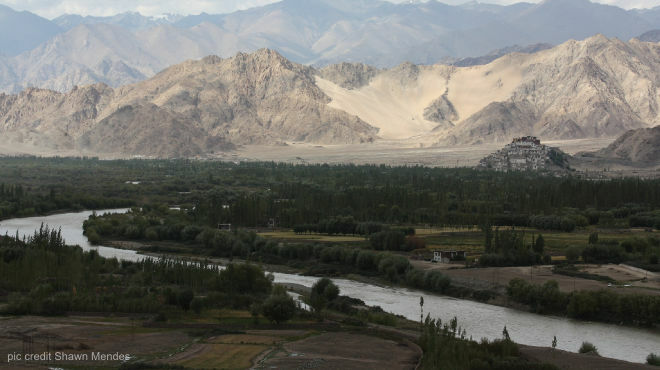 Another reason for Nubra’s seclusion is its proximity to India’s disputed border with Pakistan. With the Indian Army keeping many regions in Ladakh off-limits to non-locals, its contact with the rest of the world is further restricted. Khardung La : There are two passes that connect Leh with the Nubra Valley, with the Khardung La Pass being the more popular of the two. It also gives you a hint of just how remote your journey is about to get. Opened to vehicles as recently as 1988, Khardung La is touted as the highest morotable road in the world, and, at the northern end of the pass, the Border Roads Organisation has planted a pole with those words bravely painted on it However, the pole is nothing more than an outdated photo-op. Modern technology has since determined the pass to be around 800 feet lower than it was believed to be, reducing the ‘highest motorable road’ tag to nothing more than a, well, tall claim. It’s height has since been revised from 17,582 feet (5,359 mt) to 18,379 feet (5,602 mt). But statistics mean nothing in these remote parts, where swathes of beige rock sweep down naked mountain slopes, snow-topped, jagged cliffs give you the chills, and the sight of a crumpled vehicle that has plummeted down the mountainside reminds you just how high up you really are. The pass itself is perennially covered in snow, and snowslides, washouts and landslides can suddenly make passage impossible. The trip from Leh to the northern end of Khardung La (North Pullu) is 39 km long. The first 25 km, from Leh to the South Pullu checkpost at the southern end of the pass, is tarred and easy to navigate. Once you cross the checkpost, the road dissolves into dirt and gravel – and frosty slush. This is where the journey gets really exciting! For the next 14 km, you’re traversing a mountain road with typical switchbacks, swirling loops and dizzying turns, with drop-dead gorgeous scenic views of valleys and the occasional meadow on one side. Despite the terrifying drops and slippery dirt track hugging the mountainside – or because of them! – you’re at a complete loss for words. When you reach the North Pullu checkpost and are done with the formalities, there’s a cheerful surprise waiting for you. Billed as the ‘world’s highest café’, you can sip on a refreshing cup of green tea or slurp soupy Maggi noodles at the prettiest café you’ll ever see. After those perilous 14 km, it’s comforting to know that someone is pleased you’ve made it across! Tip : The view from the North Pullu side of Khardung La is much better than that from South Pullu. So take the time to walk around and let it all sink in. But walk slowly as the air is rarified and you run the risk of suffering from altitude sickness. Thankfully, there is a basic medical facility run by the Indian Army here, so report to the unit if you experience any discomfort.